Summer is here and with it long, warm afternoons perfect for a languid art activity using water. While cleaning the house the other day, I discovered a whole collection of circle shaped objects begging to be used. From cans ready to be recycled to my daughters sippy cups, we had circles of all shapes and sizes perfect for an art project. And, Wassily Kandisnky came to mind. If you remember, we explored his artwork awhile back with some collaging, but along with creating beautiful abstract linear works, he also really got into circles. Several of his works solely focused on the swirling, looping circle, and I figured we could re-visit Kandinsky though another fun art activity. Kandinsky was truly an abstract painter, masterfully turning shapes and lines into moving and colorful artworks. His style was vivid and exciting, which encouraged the viewer to look all over his creations, taking in all it has to offer. During the early 1900’s abstract expressionism was popular, and Kandinsky was finding his niche as an appreciated and respected artist – and is still today. I couldn’t help thinking of his painting, Several Circles, 1926, when I came across all those circular shapes, and knew my wee tot would love using them for an engaging, expressive artwork! No matter the age of your child, this is a fantastic art activity that hones shape and color recognition skills. Older children can explore the concepts of balance and design, along with discovering more about color theory. But, mostly, this is a wonderful way to learn more about an artist and be creative. Take another look at Several Circles by Kandinsky and discuss with your child how Kandinsky created all those perfectly round shapes. Invite your child to go on a circle scavenger hunt around the house and get ready to start circling! Offer your child a sheet of white paper. Kandinsky’s creation used both black and white as a background, For this project, a white paper will create vibrant results. Now your child can position all those circular objects on her paper and draw around them using a black marker. She can use a permanent or non-permanent marker – either works just fine. A black permanent marker won’t wash together with the watercolor paints in the next step. 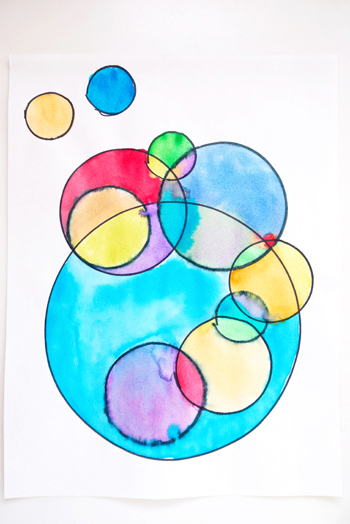 Encourage your child to have a couple of those circles overlap, just like Kandinsky did. While she is busy circling away, you can quiz her on color theory, such as what color yellow and blue create when mixed together. Now she can get out the watercolor paints and start painting in those circles. In the overlapped areas, she can experiment with her new color theory knowledge and see what colors she can create! To finish her Kandinsky inspired circle creation, she can paint the background a solid color – or leave it white, just the way it is.